I love capturing the connection between parents and their children. It's a wonderful experience and honor that I have as a family photographer in the triangle area. One second you have it figured out, then you have an immediate change dictated by the children. I also love capturing kids doing their own thing, without regards to anyone else's plans. And here's one of those moments. 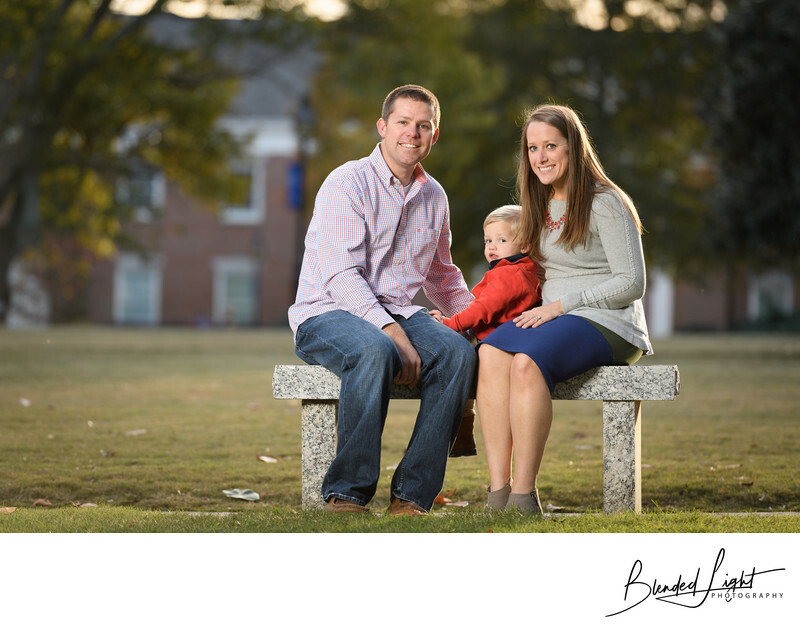 With the sun beginning to set over the campus, this bench was perfect location to use for a family shot. Placing their backs to the sun meant those warm rays would light them from behind and provide a separation from the background. I snapped a couple great shots, but wanted to ensure that I had one with all of them looking - that's what kids will cause you to do. As I was getting ready to make that last shot, their son decided to make his own change. He stood up and sat with his back to me. He was pretty serious about doing it his way, so I felt trying to get him back facing me would be counterproductive. So he sat down and let simply turned and looked back, unintentionally creating a perfect moment. As if he knew what he was doing, his position was actually perfect for the position of my off camera flash to give a powerful but soft splash of light across the entire family. That's how magical images are made - tiny moments undirected but presented perfectly. 1/200; f/3.5; ISO 160; 200.0 mm.